During the 1970s those studying the cognitive computations underlying visual search were at an impasse. One group of researchers claimed that visual search was a flat search function (i.e., adding more distracters doesn't increase search time), while another group claimed that the function was linear (i.e., adding more distracters increases search time linearly). Both groups had solid evidence supporting their view. What were the two groups doing differently that could explain such different results? As a graduate student working with Shiffrin, Schneider sat the two groups down during a scientific conference to have them figure out why their results differed so much. Needless to say, little was accomplished as both sides talked past one another. Several years later Schneider & Shiffrin came to the realization that the two groups were practicing their subjects differently. The group with the flat search function allowed their subjects to practice the search task many times before collecting data. In contrast, the group with the linear search function began collecting data as soon as their subjects could perform the task. This realization lead Schneider & Shiffrin to posit a distinction between automatic (flat search function) and controlled (linear search function) processing. In a landmark set of papers they clearly demonstrated this dual process distinction along with the boundary conditions of controlled and automatic task performance. This dual processing model posits that controlled processing is involved early in practice, while automatic processing is involved after extensive practice. Importantly, the mappings (e.g., between stimulus and response) must be consistent between trials in order for automaticity to develop. Controlled processing is characterized by slow reaction times, lower accuracy, and more conscious effort. Automatic processing is characterized by fast reaction times, higher accuracy, and largely effortless performance. Learning to drive is an example of controlled versus automatic processing in action. At first, driving is quite effortful as it is not practiced. Controlled processing is necessary during this time. Later on driving is quite effortless, involving automatic processing as long as nothing unexpected happens. Subsequent research on the dual processing model illustrated that controlled processing is due not just to lack of practice, but also persistent response conflict. For instance, the Stroop task persistently involves controlled processing and is largely impervious to practice (MacLeod showed it takes 36 hours of practice to overcome the effect). This suggests that using the neural representations for an automatic (i.e., highly practiced) task like reading for another purpose can lead to extensive conflict which must be resolved using controlled processing. Going back to the driving example, consider what happens when you reach a traffic light at an intersection. If the light is green the response, keeping your foot on the gas, is automatic since the mapping between the stimulus and response have been consistent. The same thing happens for a red light; assuming you don't run red lights, the stimulus (red) is consistently paired with the response (stepping on the brake) making it automatic. A yellow light, however, involves a great deal of conflict. On some occasions you may have pressed on the gas quickly to make it through the intersection in time. On other occasions you may have slammed on the brakes in order to avoid running a red light. This varied mapping between stimulus and response makes it so that the moment a yellow light is encountered while driving controlled processing is necessary (despite extensive practice). The dual process model places all behavior on a continuum between controlled and automatic performance. Since the brain computes that behavior, there must be some neural substrate underlying controlled and automatic processing. My current research is finding and characterizing this neural substrate. I'll be covering more of this topic in future posts. Implication: The mind, largely governed by reward-seeking behavior on a continuum between controlled and automatic processing, is implemented in an electro-chemical organ with distributed and modular function consisting of excitatory and inhibitory neurons communicating via ion-induced action potentials over convergent and divergent synaptic connections strengthened by correlated activity. 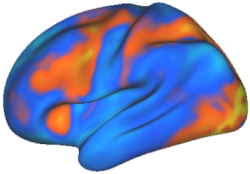 The cortex, a part of that organ composed of functional column units whose spatial dedication (determined via local competition) determines representational resolution, is composed of many specialized regions involved in perception (e.g., touch: parietal, vision: occipital), action (e.g., frontal), and memory (e.g.,short-term: prefrontal, long-term: temporal),which depend on inter-regional communication for functional integration.